The IVIVCPlus™ Module is an optional add-on module that provides a convenient way to develop mechanistic and/or traditional correlations (IVIVC) between either in vitro release and in vivo release or in vitro release and absolute bioavailability. 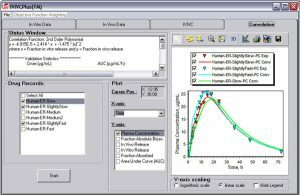 The formed correlation can then be used to predict plasma concentration-time profiles for formulations with different in vitro release rates or dose strengths to support internal research and regulatory applications (e.g., establish product specifications). 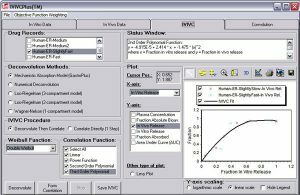 GastroPlus was the first software program to offer “mechanistic deconvolutions”, which deconvolute, or fit, the in vivo dissolution vs. time along the gut lumen using the Weibull function (NEW in version 9.6: triple Weibull function options!). An advantage to using the mechanistic deconvolution method is that it can be linked to a PBPK model (through the PBPKPlus™ Module). We are pleased to validate the mechanistic deconvolution method through a 5-year Research Collaboration Agreement with the U.S. FDA. The Mechanistic Absorption Model (GastroPlus) deconvolution method directly deconvolutes the in vivo release rate.The other four approaches are traditional deconvolution methods that calculate the rate of appearance of compound into the systemic circulation. For formulation scientists, the correlation between in vitro release and in vivo release is much more intuitive and valuable. Depending on the deconvolution method selected, a correlation can be made between in vitro release and in vivo release or in vitro release and absolute bioavailability. Linear, power, polynomial (second or third order), and, NEW in version 9.6, time scale/shift functions may be selected for the functional form of the IVIVC. 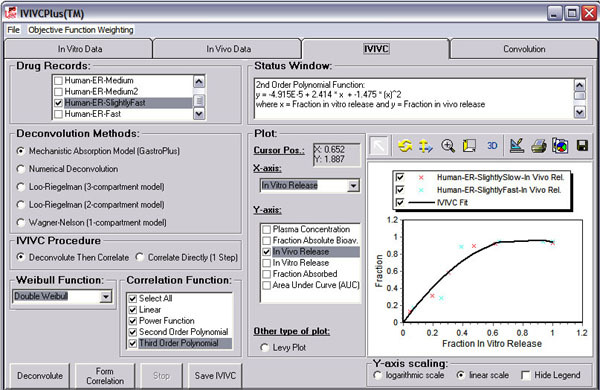 Run Convolutions: the correlation function can be used to calculate an in vivo release or absolute bioavailability vs. time profile from a developed IVIVC for a new formulation exhibiting different in vitro release vs. time kinetics. A plasma concentration vs. time profile for the new formulation can then be constructed with the deconvoluted in vivo release-time or absolute bioavailability-time profile and the underlying PK/PBPK model. 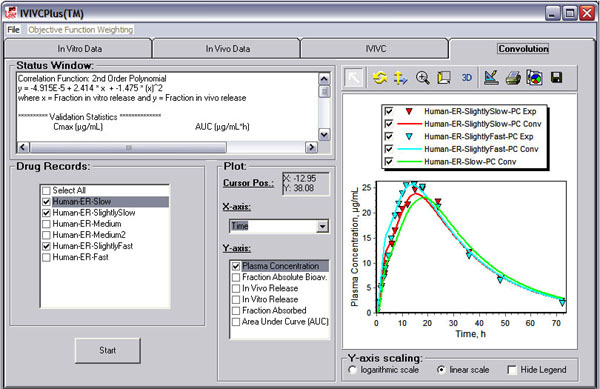 Evaluate Validation Statistics: after running a convolution, the IVIVCPlus™ Module outputs the observed values, predicted values, prediction errors, and mean absolute percent prediction error for both Cmax and AUC to validate the IVIVC. These statistics can be used to evaluate the internal or external predictability of the correlation as described in the FDA’s “Guidance for Industry Extended Release Oral Dosage Forms: Development, Evaluation, and Application of In Vitro/In Vivo Correlations”.